A 24-year-old male had a road traffic accident in which he sustained a crush injury to his right lower leg and a compound fracture of the right femur, which were respectively treated with below knee amputation and metallic nailing of the right femur. The patient presented to the outpatient clinic 7 years later with 1-month history of pain and swelling of the right thigh; however, he didn’t report any fever. An FDG-PET scan was prescribed to rule out infection. 18F-flourodeoxyglucose (329 MBq) was injected intravenously and PET/CT imaging performed after 60 minutes on a PET/CT camera (GE 710). A CT scan without oral or intravenous contrast, without breath holding, was acquired at low mA level for attenuation correction and localization purposes only. Arms were held up. Subsequently PET images from vertex to toe were obtained. PET, CT and fused images were reconstructed in the transaxial, coronal and sagittal axes (Figure 1). The PET/CT scan images show extensive accumulation of FDG-avid fluid in the right thigh starting from the level above the nail in the mid gluteal region. Focal uptake is seen in the soft-tissue above the femoral neck with the high FDG uptake (SUVmax 12.7). There is FDG-avid fluid surrounding the intramedullary nail (SUVmax 3.8 to 5.9). The PET/CT scan shows extensive hypermetabolic fluid uptake in the right thigh in different soft-tissue regions including: 1) subcutaneously in the lateral aspect of the right thigh, 2) from mid to lower right thigh (SUVmax 12.6), 3) intra-facial, 4) sub-facial, 5) intraseptal, 6) inter and intramuscular (SUVmax 9 to 15.5). See Figures 1-3. The PET/CT scan findings were consistent with multiple hypermetabolic abscesses at different soft-tissue levels in the right thigh. There was however no evidence of osteomyelitis seen. 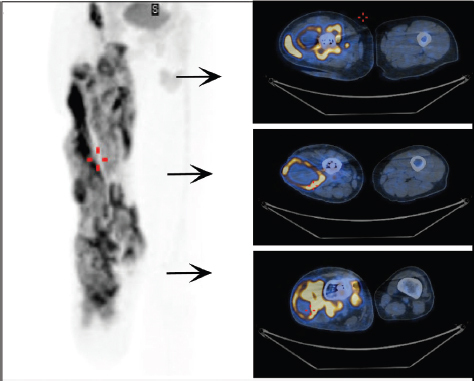 Hybrid positron emission tomography/computed tomography (PET/CT) with the glucose analogue, 18F-fluoro-2- deoxyglucose (18F-FDG), is being increasingly used for the diagnosis of musculoskeletal infection. Activated granulocytes present at sites of infection/inflammation use glucose as an energy source and avidly take up FDG, which is transported into the cells and phosphorylated by hexokinase to 18F-fluoro2-deoxyglucose-6-phosphate, that is not further metabolized. Increased cellular metabolism in the activated inflammatory cells results in an increased expression of glucose transporter (GLUT) proteins by these cells, which coupled with an increase in the affinity for glucose by the glucose transporters secondary to the effects of cytokines and growth factors, results in high FDG uptake at sites of infection/inflammation [1, 2]. This striking case of florid and extensive soft-tissue infection in the right thigh 7 years post surgery demonstrates the effectiveness of this new infection imaging modality in the non-invasive diagnosis of infection. 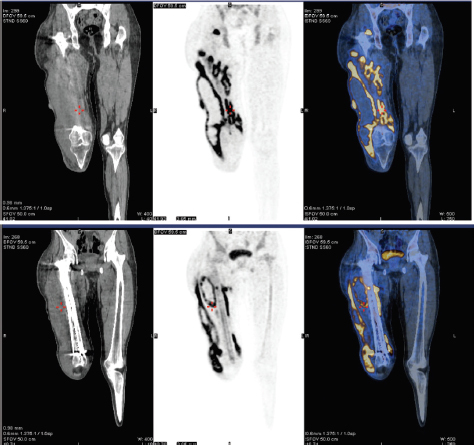 The combination of PET and CT provides complementary information at a higher resolution and sensitivity as compared with single-photon emitting radionuclides. FDG-PET technique demonstrates the metabolic changes that occur earlier compared to the anatomical changes seen by CT or MRI alone. The high metabolic activity of infective abscesses due to a high degree of FDG avidity coupled with structural CT changes of infection facilitates rapid interpretation of both the severity and the extent of infection and helps delineate osseous from soft-tissue involvement. The PET/CT scan in this case showed multiple hypermetabolic areas which were precisely localized to the soft-tissue and showed no bone involvement. The findings are extremely helpful in determining and instituting the appropriate treatment and also useful for monitoring the therapeutic efficacy. PET/CT scan, 18F-FDG, infection, soft-tissue. Signore A, Glaudemans AWJM. The molecular imaging approach to image infections and inflammation by nuclear medicine techniques. 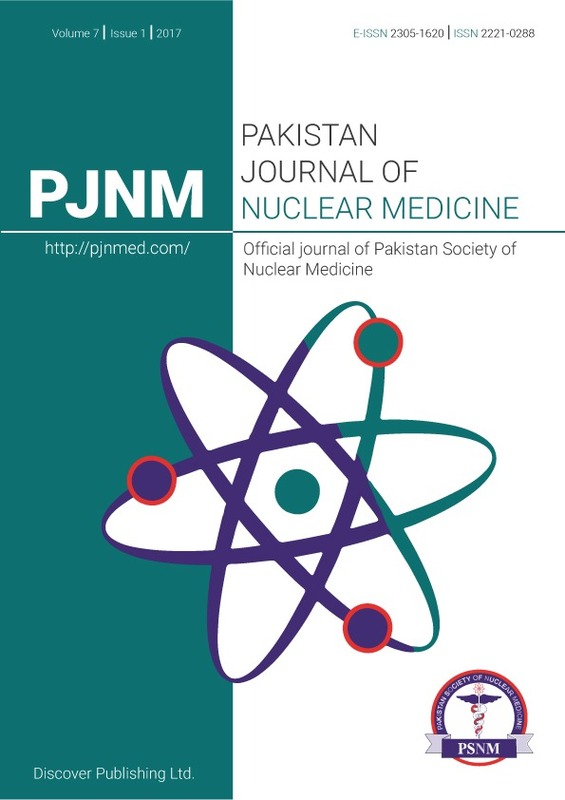 Ann Nuclear Med 2011; 25(10):681–700. de Winter F, van de Wiele C, Vogelaers D, de Smet K, Verdonk R, Dierckx RA. Fluorine-18 fluorodeoxyglucose positron emission tomography: a highly accurate imaging modality for the diagnosis of chronic musculoskeletal infections. J Bone Joint Surg Am 2001; 83- A:651–660.